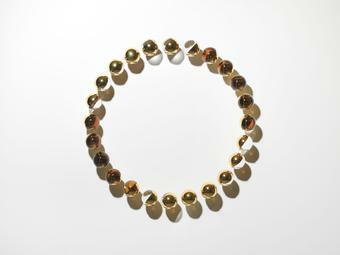 In Your solar attention, twenty-four glass crystal spheres are hung on a wall in a circle. 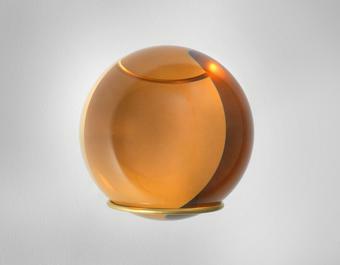 Each sphere is coated in gold on one half of its surface, dividing the spheres into two hemispheres, one transparent and the other polished gold. 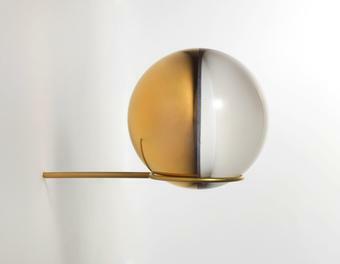 Resting on brass braces, the spheres are angled along their axes at approximately sixty degrees and rotated slightly in relation to the others, creating a progression around the circle as the golden hemispheres turn to face the viewer and then away again. 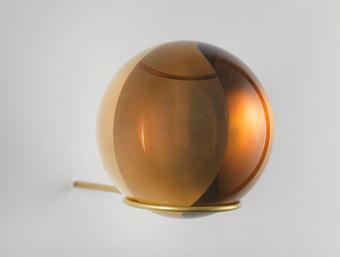 Reminiscent of an astrological model, the artwork functions as an optical device in which multiple reflections of the viewer and her surroundings shift and change as they are coloured by the gold, distorted by the curved surfaces, and warped inside the crystal spheres.